I transferred the patterns (which are drawn without any seam allowances) to the fabric and added seam allowances only on the side and shoulder seams. I had no sleeves and I wanted to see how the neck line and sleeves fit Greta (these are the “final” measurements). Oh, and I added a seam allowance at the front so I can pin the front pieces together. So about the fit… Bunka sloper fit’s as a glove. I was very surprised! Bust point in the right place, waist where it should be, quite close fitting but still with some ease. However, Aldrich sloper was shorter and wider at waist and narrower at chest. Also it had more ease even though the calculations included 1 cm less ease when calculating full width across bust. Here you can see that the armhole is deeper in Bunka sloper (another surprise for me) and you can see another problem on the Aldrich sloper – see the extra fabric towards the back of the armhole? Here you can see the difference is armhole size for the slopers, Bunka being deeper. Also, Aldrich sloper does not sit horizontally – back is lower than the front. The back neck on both slopers seems to high on both slopers, but that just might be the problem with the neck width I mentioned when adjusting Greta. This is the best view to see the problem with Aldrich sloper at the back near the armhole. Too wide. 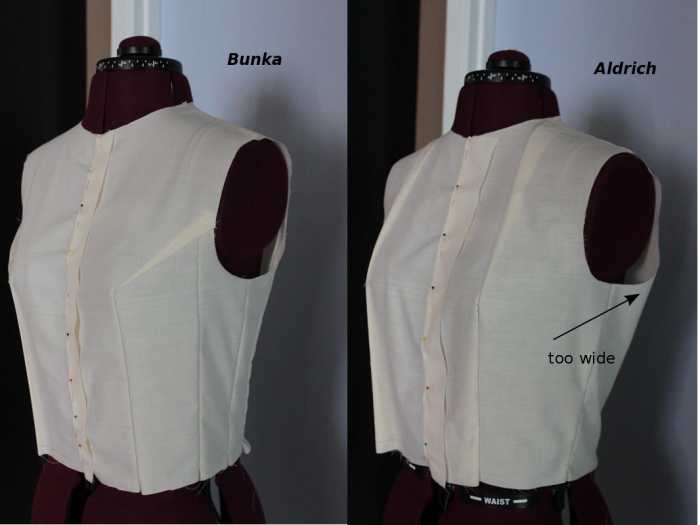 Bunka fits very well… there seems to be a little extra fabric in the back, between the bottom of shoulder and top of waist darts, but that just might be because the back is bit smaller on Greta (and somewhat flat if I can say so…). So the verdict. Bunka fits very well, and I would actually not do any adjustments for a better fit. 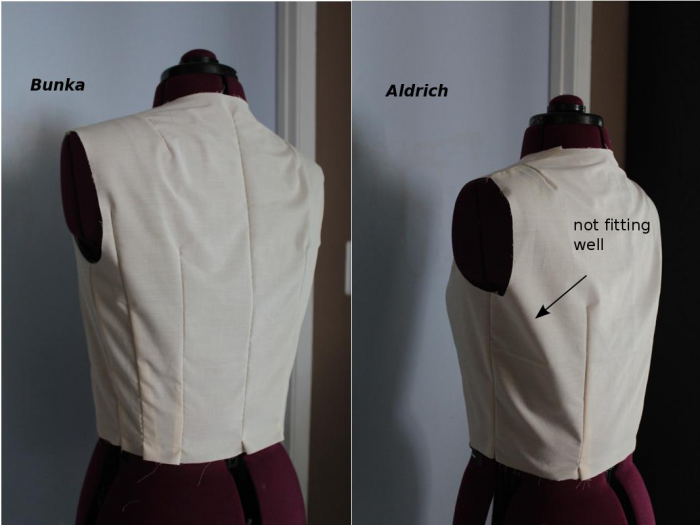 The Aldrich sloper does not fit so well, but that does not mean it would not improve with some adjustments (it probably would) or that it would not fit another body type. Or maybe I just made a mistake (not so likely 🙂 thinks the geek in me). So why did I do all this. I have been reading/thinking about this for a few weeks now. I have been so focused on this, that I have even dreamt about it on occasion. So what is next for me? 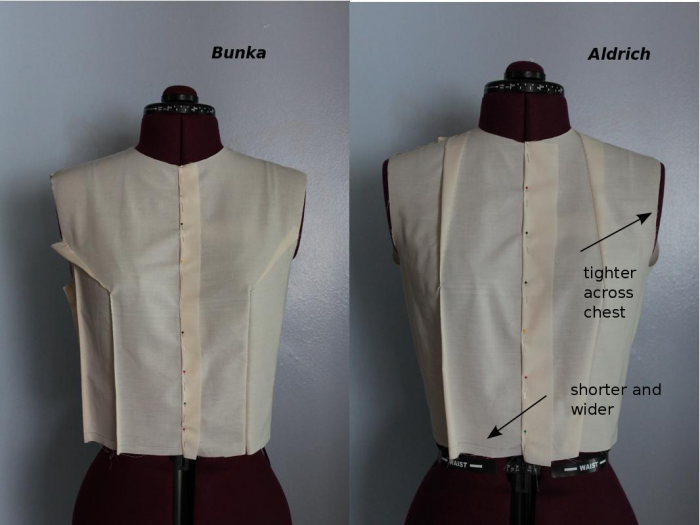 I will try to construct a few tops using the Bunka sloper (similar to Mrs Stylebook) and then I am planning to start a longer term project starting in Semptember when I will be creating more projects/garments and posting instructions here/on my blog. I am going to challenge myself to try and create a pattern a week just by looking at the picture of a piece of clothing I like, and manipulating the sloper. Will it work? I don’t know, but it might be fun! And it could be a good way to learn patternmaking. Would you like to make patterns and sew with me? This entry was posted in patternmaking, sewing on June 10, 2011 by flekka. Sounds like a great idea! The problem I have run into with the Bunka sloper is that my high bust measurement is 40 inches and my full bust is 46 inches, which is well larger than the the standard Japanese sizing. Do you have any advice on doing the math to adjust for the smaller Japanese sizes? I would really like to make the bodice and skirt sloper, so that I can have more freedom with my sewing. Have you tried the Bunka sloper? I looked in the book again and it seems that this method works best for 80-89 cm bust (31.5 to 35 in). They based the math on fitting the sloper to those as well as some smaller and larger bust sizes, so it might work up to 104cm bust (41 in) even though some adjustments are required. I vaguely remember seeing a method somewhere of how to modify a pattern for larger bust but I don’t remember where anymore… I will let you know if I find out. For your Aldrich sloper, not only is the waist not horizontal, but the side seam is not vertical…looks like either the front needs tugging down or the back needs pulling up. I wonder what is stopping it sitting in the right position. Perhaps either the upper front is too short or the upper back to long. When I go back to your drawings, it seems the front is too short. What an interesting exercise. I would like to do this myself. Years ago, I made the Aldrich sloper. More recently, I made a sloper from the European Cut. My measurements have changed in those years, so they are not diredctly comparable, but perhaps I will go and repeat your exercise. I have the instructions for the Bunka, so I could compare those as well. Your Bunka sloper fits beautifully. I always thought my body shape was too pear shaped for the bunka sloper, but I might give it a shot. I’ve just found these entries and wanted to thank you for the comparisonsâ?¦ I have both books as well. I was thinking of doing something similar and comparing yet another draft I have and overlaying them on top of each other. One thing to consider, in terms of fit, is that the dress form’s shoulder rotation and general shape of ‘armhole’ is almost symmetrical (at least my dress form is) front to back–so while it looks good on the form, it might not on a body. Our shoulders are not so symmetrically oval. 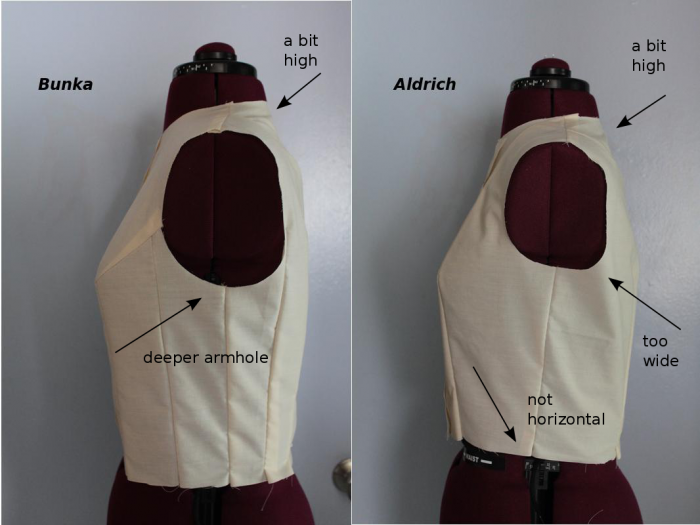 I wonder how the Aldrich would fit on an actual bodyâ?¦ I kind of like her armhole shape a little better. It’s almost like the two are completely opposed–the back of the Bunka being more scooped out and the front of the Aldrich being more scooped. Also, just thinking out loud, it seems like the neck is the source of the other problems in the Aldrich–I wonder if the back neck were scooped out a bit, if the whole thing would rotate back onto the body properly. It looks like it’s pulling the whole thing up and back? very nice comparison. 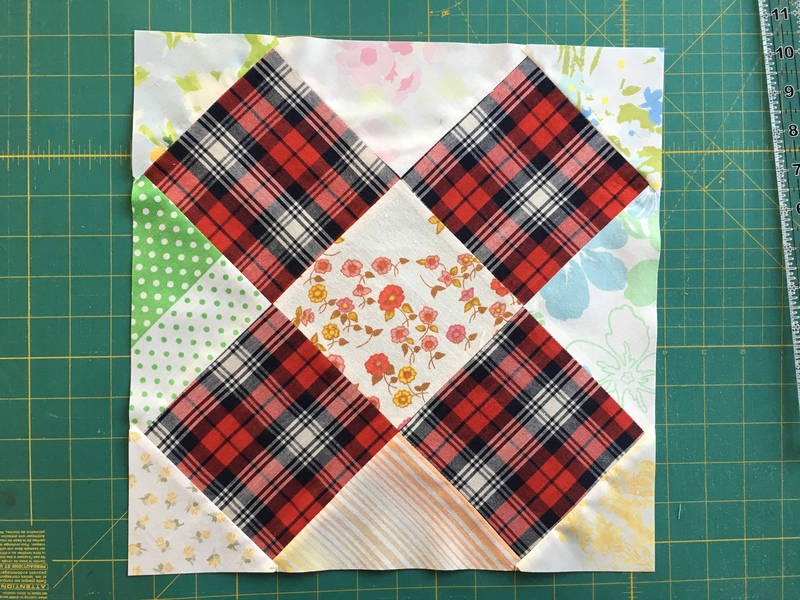 I myself have been trying different slopers for the past two weeks… and honestly BUNKA works the best. only with the exception of the tolerances. I’m thinking of doing smaller tolerances and I am sure it will fit even better. By the way the neck of the mannequin has a different slant forwards than the human neck and that’s why all the toiles seem a bit tighter in this area.